Nestled in the hills just below the medieval town of Fayence, this charming house features a beautiful garden with swimming pool. With stunning views of the valley, the southwest-facing house enjoys sun most of the day and the early evening. The three-storey house is 250 m2 and the property grounds are 10,000 m2. The child-friendly property has a small playground and a shallow end to the swimming pool. The infinity pool has a saltwater system and can be heated. The olive-tree-lined garden is designed in the classic French-style, and the trees are lit at night, adding to the charm. 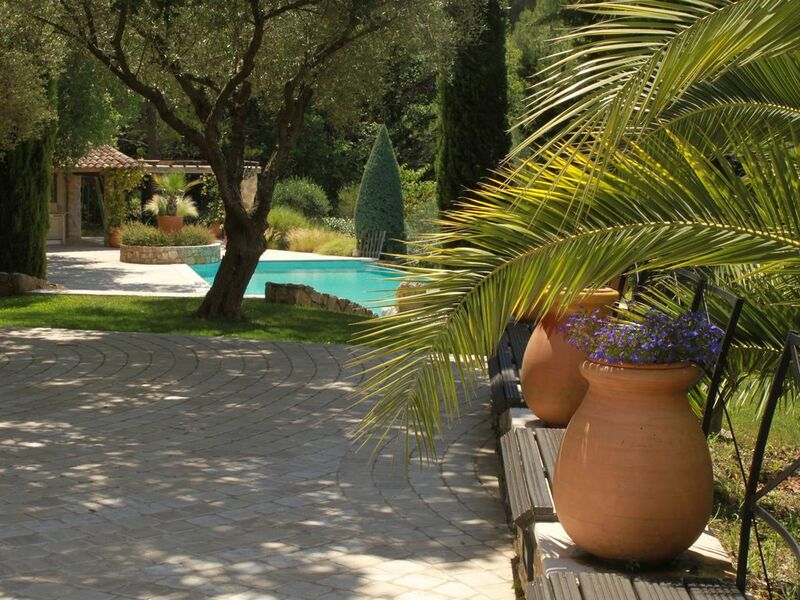 With only a couple of neighbours nearby, the surrounding area is quiet, but the villa lies within walking distance of the village of Fayence with all its amenities, including typical Provencal markets and restaurants. Activities : The area offers so many different activities from biking, hiking, horse riding, surfing and mountaineering. The beaches are not far away and there you have the possibility of renting boats and doing wind surfing when weather permits. excursions: The area offers many interesting visits to old towns and vineyards. You are close enough to visit places like St. Tropez, St. Raphael, Cannes, Nice and Monaco. Golf: If you come to play golf you have come to paradise. There are more golf courses within 30 to 60 minutes from the house and all very good courses. All bathrooms are spacious with colorfull tiles typical for Provence. The bathrooms are all new. Wonderful location close to the lac du San cassien. A short walk to Fayance where we dined in the square. Pool is clean and well maintained. Spacious gardens with a playground for the children. Very well run and organised. We will be back! Yet again, the photos don't do this property justice - it's much bigger than we expected and quite simply, gorgeous! Ample room for 8 people to either be together or scattered around the property. We enjoyed 2 fabulous weeks here with family and friends coming and going. All were super impressed with the location - minutes from Fayence, grocery shops, several beautiful villages and the beach! Only 40 minutes from Nice airport, too. The only suggestion would be to better kit out the kitchen - very limited glassware, no measuring tools (I'm a keen cook so would have like to create more) and saucepan lids were scarce! However, plenty of plates, mugs and cutlery so eating all the available fresh produce was not a problem. We would certainly recommend Fayence, Bonofont and Blackwood Villas for a truly spectacular holiday. We will most definitely be back to the area in the future. Thank you. We stayed in July for one week and came back again in August for another week because we loved the villa so much. It is very family friendly with an alarm in the pool which was great peace of mind with a 14 month old who loves the water. The pool area and terrace are really stunning and it is very quiet and peaceful. Above all we felt like we were staying in a family home - it has been beautifully decorated but at the same time feels homely - so a very nice environment for a relaxing holiday. I wouldn't hesitate to recommend this villa. Thanks for the feedback Kate . I am so glad you enjoyed the house and pool. It was an unusually hot summer - the hottest in 20 years so fans were out of stock everywhere, thankfully now we have replaced them. It is a shame about the roadworks as well, normally all work stops in May so guests can have a peaceful holiday, perhaps it was emergency work. What a great house in a terrific location ! We had a delightful fortnight in glorious weather, during Jun-'09, so were able to take full advantage of the extensive outdoor dining facilities, pool and sun loungers...oh and we never got bored of sipping rose on the terrace whilst taking in the views across the valley as the sun went down ! The property itself is tastefully decorated and feels much more like a home than other properties we have rented with the added bonus that it is kitted out with just about everything you could possibly require. If you feel the need to venture out Fayence is a pretty town within walking distance and has an abundance of good restaurants and shops. The market is particularly good and well worth a visit to sample local produce. We went there with our two children and had two lovely weeks! The garden, pool and playground is really great for the children and safe! There is everything for children even for little ones as a highchair, bed etc. It is a lovely walk to the village close by with a market, shops and cafes. We did not want to go back home!!! There are several villages neaby and it is a typical Southern French area with local markets, the cafeés and good local restaurants. Fayence is close to the mediterranian coast so it is easy to go to the beach or just visit the fun places like Cannes, Nice, Monaco and St. Tropez. Prices include linen and towels. Pool towels included. Final cleaning included in price. For rentals over several weeks we will change linen once a week and clean bathrooms. For rentals in Low season and long term rentals utilities are not included.